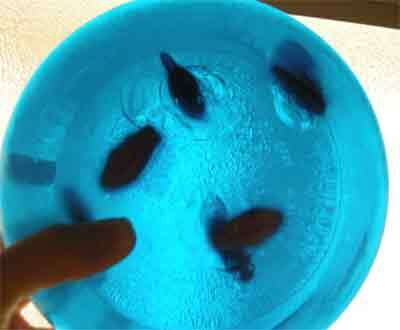 Professional Mothering: Mommy, what happens to fish in the winter? Well, it's a good thing that ice floats, or they would all be dead. Luckily, what happens is that they just keep swimming and and living during the winter as they do in the summer, but the lake freezes on top. Yesterday we illustrated this with a tasty treat, albeit with foods containing food coloring and corn syrup, which are usually avoided in this house. 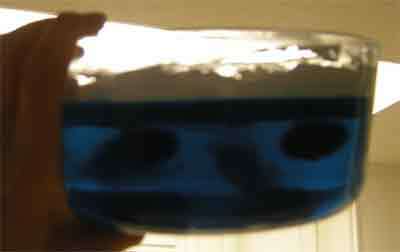 We made blue jello and added Swedish fish. If you add them right away, they will all sink to the bottom, so it's best to let the jello set a couple of hours before adding them. My husband is the one who put the fish in, and he said that after some experimentation, the cleanest way to put the fish in was to make a slit in the jello with a butter knife and then push the fish in with the knife. When the jello was ready we pulled it out compared our treat to fish in a lake during the summer. In the winter, the surface of the lake sometimes freezes, and then is covered in snow. If the ice is strong enough, people sometimes go ice fishing. Our snow and ice was demonstrated with whip cream. The children loved it!